A sharp, nostalgic homage to the golden era of radio, told as both a memoir and a social history. Nachman, a columnist for the New York Times syndicate, attempts to explain just how radio came to define American pop culture from the 1920s to the ’40s by examining the personalities, genres, and behind-the-scenes politics of network radio productions. As the earliest tycoons (like George Washington Hill of the American Tobacco Company and barn broadcaster Dr. Frank Conrad) contributed to radio’s availability and mass-market appeal, a boom began that drew talent of varying degrees and generated a patriotic hype not unlike that which surrounds today’s information superhighway: radio was to be the American medium that would bring culture and democracy around the globe. Instead, it introduced advertising to the country and created the formats’soap operas, news, sports, variety, sitcom, and drama—that remain in popular entertainment to this day. 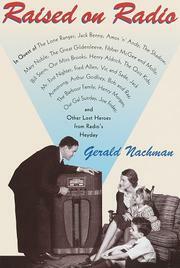 Nachman recalls the 30 remarkable years of radio’s reign by remembering the programs—inspired first by vaudeville, then by Broadway—that he enjoyed as a child: from the sassy satirist Fred Allen (—the David Letterman of radio—) to the fluffy but arousing teen-girl dramas like Junior Miss. Mirroring the country’s domestic politics, radio programs of that era attempted to sweeten immigrant stereotypes and launch antiracist images of blacks (in what Nachman calls —a rather thin rainbow coalition—): the Italian immigrant comedy Life with Luigi, the blue-collar characters in The Life of Riley, and the Jewish family in The Goldbergs all told the immigrant story with bursts of ethnic humor and staunch American patriotism. Beulah, a show about a black maid, tried to honor black culture (while using white actors—a practice that happily died out early on). Still lovable despite its flaws, network radio through Nachman’s eyes is a treat. A humorous account of a radiophile’s memory and longing for the return of the lost era.